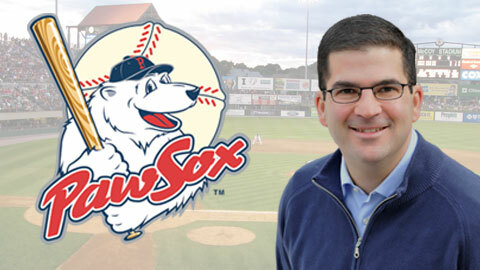 The Pawtucket Red Sox have named Bob Socci as one of their new radio broadcasters for the 2013 season. Bob will partner with another newcomer, Jeff Levering who was hired last month, as the duo will broadcast all 144 PawSox games on 920 WHJJ and the 13-station PawSox Radio Network. Socci, 45, has spent the past seven seasons as a radio broadcaster for the Norfolk Tides the Triple-A International League affiliate of the Baltimore Orioles in Norfolk, VA. He is also the college football play-by-play broadcaster for the United States Naval Academy being heard on the Navy Football Network since 1997. Bob, who lives in Milton, MA with his wife Monique Tello and their children Gio (2½) and Maria (1), will be on the air for all 144 PawSox games (home and away) this season. He will team with Levering who joined the PawSox full-time earlier this month after three seasons with the Springfield Cardinals (Double-A) in Springfield, MO. Bob and Jeff replace Aaron Goldsmith, who received the call to the big leagues with the Seattle Mariners this past January, and Steve Hyder, who left the club this off-season after nine years with the PawSox. "After years of calling baseball in some wonderful places, I'm extremely honored and excited to join the PawSox," said Socci. "This is an opportunity to be part of a model organization, with a renowned broadcasting tradition and a tremendous following. It's especially meaningful because it allows me to call games from the place I now call home. "I look forward to working with Jeff to form a team that continually earns the trust of PawSox fans everywhere and builds on the great legacy established by those who came before us in the home radio booth at McCoy Stadium." The well-documented group of former PawSox broadcasters in the "big leagues" - all of whom have gone directly from Pawtucket to the major leagues - include: Gary Cohen (PawSox radio in 1987 & '88) who has been with the New York Mets ever since leaving the PawSox, Don Orsillo (1997-2000) who will begin his 13th season with the Boston Red Sox on NESN this spring, Dave Flemming (2001-2003) who has been a radio voice of the San Francisco Giants for the past nine years including two World Series titles in the past three years, Andy Freed (2001-2004) who has called Tampa Bay Rays games since leaving Pawtucket, Dave Jageler (2005) who was with the PawSox for just one season before he took over as the Washington Nationals radio voice where he has remained ever since, and Aaron Goldsmith (2012) who also spent just one season with the PawSox before getting the call to Seattle. Furthermore, Dan Hoard, who was a PawSox radio broadcaster from 2006-2011, became the new Cincinnati Bengals (NFL) radio voice in the fall of 2011. "We are pleased to welcome Bob Socci to the PawSox and the PawSox Radio Network led by our flagship station 920 WHJJ," said PawSox President Mike Tamburro. "Bob is a highly-respected broadcaster who we have always liked and admired when he visited McCoy with the Norfolk Tides. His long association with Navy football and basketball prove his talent and versatility. He and Jeff Levering will form another terrific tandem as they continue the proud tradition of PawSox radio excellence."